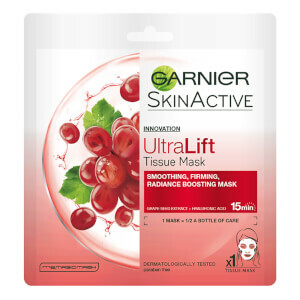 Restore a youthful radiance to skin with the Garnier Ultralift Anti Ageing Face Sheet Mask, a glow-boosting treatment that works to improve tone and texture. Enriched with Grape Seed Extract and Hyaluronic Acid, the face mask works to pump high levels of moisture into the skin, creating a plumper and firmer visage and smoothing out the appearance of fine lines and wrinkles. A brightening effect helps to balance out any discolouration, leaving the complexion looking younger, healthier and lit from within. 1. Desdobre a máscara. Aplique cuidadosamente no rosto limpo com a película protetora azul visível do lado exterior do rosto. 2. Retire a película protetora azul. Ajuste a máscara aos contornos do rosto. 3. Deixe atuar durante 15 minutos e relaxe. Retire a máscara. Massaje delicadamente para que a fórmula em excesso seja absorvida, ou use um disco de algodão para a remover. 967326 1, Aqua / Water, Propanediol, Butylene Glycol, Vitis Vinifera Seed Extract / Grape Seed Extract, PPG-1-PEG-9 Lauryl Glycol Ether, PEG-40 Hydrogenated Castor Oil, Coceth-7, Sodium Hyaluronate, Sodium Polyacrylate, Sodium Polyacrylate Starch, p-Anisic Acid, Hydroxyacetophenone, Biosaccharide Gum-1, Xanthan Gum, Phenoxyethanol, Parfum / Fragrance, (F.I.L B204336/1).